Thanksgiving is almost here and that means that come tomorrow there will be lots and lots of food to eat (cue happy dance!!!). And because there's always room on the Thanksgiving table for more dishes and treats, we asked New York City ballet dancer and food blogger Jenelle Manzi (who is no stranger to creative culinary concoctions) for her favorite fall recipes of the moment. Whip up these tasty treats as apps before the big meal or serve them as additional side dishes—because there are never too many of those. Happy eating! I created this smoothie as a way to provide my body with a nutrient dense boost to fuel my morning. With it's thick creamy consistency and balance of spices, it tastes like pumpkin pie, which is the ultimate win. Pumpkin and zucchini give a smoothie density and texture, while also providing a healthy dose of vitamin A and C and beta carotene (which all go hand in hand with healthy, glowing skin). I chose to spike this smoothie with a favorite medicinal mushroom of mine: Chaga (but you can easily omit). Chaga is called the "king of medicinal mushrooms" and is a potent immune system booster. It has a mild and earthy flavor that's extremely versatile when mixing it into your favorite smoothie or shake. Enjoy! Simply wash and slice the squash in half, pit the seeds, and bake face down covered with foil at 375℉ for at least 40 minutes or until the flesh is tender. Allow the halves to cool and scoop out the flesh. (I typically keep mine in a tupperware in the refrigerator for easy smoothie prep). Place all of the ingredients into a blender and blend until creamy and smooth. 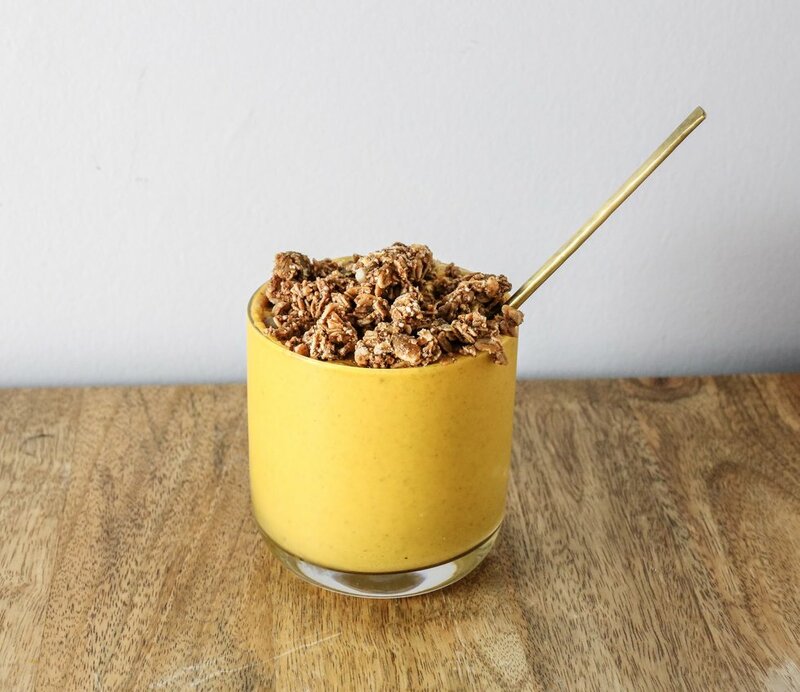 Pour into a glass and top with your favorite granola (I used homemade cinnamon pecan here)! Yes I know, another kale salad! But trust me on this one. Ever since I introduced this salad to my family's Thanksgiving table five years ago, it's been a staple every year. It's packed full of delicious ingredients like toasted walnuts, creamy goat cheese, caramelized butternut squash, pomegranate seeds, and an incredibly addictive lemon tahini dressing. Also, the key to a good kale salad is to massage the kale—this aids in breaking down the toughness of the plant fibers for easier digestion and releases a sweeter flavor in the kale. Let's get to it! -Preheat oven to 400℉. Place cubed butternut squash in a large bowl, drizzle with olive oil, and sprinkle with pinch of salt and coconut sugar. Toss to evenly coat the squash. Spread the cubes evenly on a baking sheet lined with parchment paper. Bake for 25-30 minutes until squash is tender and caramelized. -De-stem and chop your kale and add it to a large bowl. Next prepare your dressing: In a small bowl, whisk together the tahini, olive oil, lemon juice, honey, and salt with a tablespoon of water until smooth. Pour the dressing over the chopped kale and use your (clean) hands to gently massage the dressing into the kale for about 3 minutes until tender. 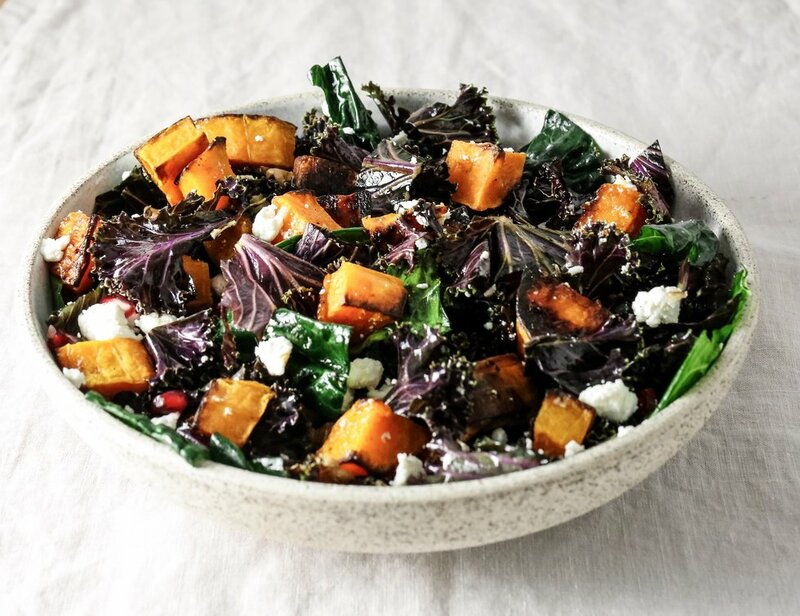 -Once the butternut squash has cooled, add it to the kale along with the pomegranate seeds in a large bowl and toss to combine. Top with crumbled goat cheese and toasted walnuts and serve. Note* This salad can be made a day ahead of time. Just top with almonds and goat cheese once ready to serve.